As might be expected given my documented efforts to dress like a grownup, I’m experiencing a bit of a wardrobe overhaul. I haven’t necessarily purchased that many more things, but I’ve definitely noticed items that are getting less worn. Or... never worn. Seriously, there are things I packed up around this time last year, hauled to our new place, unpacked, and let them sit in my closet doing nothing but getting in the way of clothes I actually wear. Given my twee closet size, that’s an egregious waste of space. It’s not the most disorganized closet ever, no. But what can’t be conveyed in just the photo alone is how little I wear some of that stuff. Take the two (two!) bathrobes on the back of the closet door. The pinkish one I’ve had since high school. The red one is newer and nice and fluffy, a gift from a few years ago. I don’t know why I kept the old one when I got the new one. And I don’t know why I keep the new one when I don’t wear either one of them. That is some valuable back-of-the-door real estate taken up by two items I don’t think I’ve used in years. There’s a similar story running through the rest of the closet. Now, don’t get me wrong, there’s nothing in my closet I haven’t worn ever. I often have the opposite problem – I don’t wear many of the things in my closet because they are too worn for me to wear them again without embarrassment. Because really... wearing cardigans to cover holes? Stains I selectively ignore? Yeah, those need to go. So I spent last weekend getting it all out there. Shoes with the soles flopping off, sweaters that haven’t been flattering in years, shirts that I like but fit into the rest of my wardrobe about as well as the turquoise curtains fit into the rest of our apartment. And when I was done... I filled it all back in. 1) New shoe shelf! Now the only shoes on the floor are my tall brown boots. Before, my shoes were hidden by the hanging clothes – no more! 2) I hung my cardigans on wooden hangers, last seen beautifying our coat closet. Someday all of my hangers will be wooden, but this is a start! 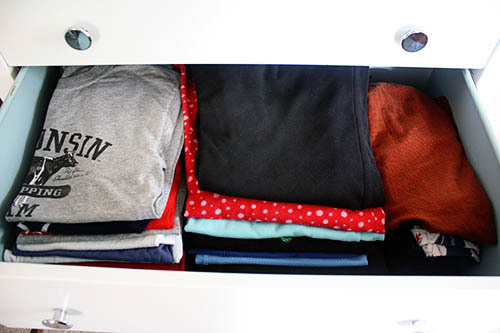 3) Removing the cardigans from the shelf meant I could put my pared-down sweater collection in their place (thus emptying out a dresser drawer). 4) Clearing out the jeans and shorts I don’t wear anymore meant they could be consolidated into a single stack, too. 5) Before, I had tank tops hanging in the closet AND residing in a drawer across the room. Now they’re all in one nicely folded stack in my closet. 5) Sweatshirts and hoodies got pared down to a select few, and the remainder got stashed in the cubby at the top. 6) The top, by the way, is where I used to store my overnight duffel bag. Now it’s stashed in the back on the floor now, behind my laundry basket. I know where it is when I need it; otherwise, it’s out of sight and out of mind. So yes, there’s probably the same amount in the closet as there was before, but that’s because I moved it all out of the dresser drawers. Which means most of my wardrobe is in that closet, save for dresses, dress pants, skirts, and scarves in the other closet. That’ll get attention soon, too! With everything neatly folded and slightly staggered to see the contents! Honestly, just pulling everything out and re-hanging or folding neatly felt like it refreshed my closet – I recommend that, if nothing else! But condensing my clothes and getting everything where I can see it (instead of stashed away in drawers) really helped me see what parts of my wardrobe I could relinquish in another round of closet-cleanout. Which means... if I do splurge on a nice top, I know exactly what I’ll get rid of in its place. Of course, there’s more work to do... perhaps starting with getting the discarded clothes to the donation box. And while improve the clothes in the closet, I’d also like to improve the closet itself (like the aforementioned wooden hangers). Still... progress! Slowly but surely, I’ll swankify this closet!